The Bog Elfin and the Eastern Pine Elfin are actually closely related, and fall into the pine-feeding group of elfins, which some authors still prefer to put in the separate genus Incisalia. The Bog Elfin was not known to Scudder or Harris in the 19th century. It was first described in 1934 from a large black spruce bog in the town of Lanoraie, Quebec, and is named for the town. It occurs in several locations in New Brunswick, Quebec, Ontario and Nova Scotia (mapped in Layberry 1998), and in many bogs in Maine, a few in New Hampshire, one in New York, and at least three in Massachusetts. There are probably fewer than 50 documented occurrences in North America (NatureServe 2010; Cech 2004). The southern-most known locations for Bog Elfin in North America are in central Massachusetts. The most well-known site is at Tom Swamp, part of the Harvard Forest in Petersham. Bog Elfin was first discovered in Massachusetts at Tom Swamp in 1996. Presumably the species has been present in the state all along, but simply not found by earlier observers. There are also two other known state locations for Bog Elfin: Rutland, where the species was found in 2001 by Mike Nelson of the state Natural Heritage and Endangered Species Program, and Ashburnham, where in 2013 Bog Elfin was photographed by Bruce deGraaf and Garry Kessler ( http://brucedegraaf.zenfolio.com/p647890857/e5fec675e and http://garrykessler.zenfolio.com/p862720637/h5fec912a#h5fec9122 ). There are a few other possible sites in Massachusetts, for example in Barre and Hardwick, but C. lanoraieensis has not yet been found at these sites. Range-wide, it is not unusual for Bog Elfin to be absent from many seemingly suitable bogs (NatureServe 2010). Note to Collectors: Bog Elfin is listed as a Threatened Species in Massachusetts, and collecting without a state-issued permit is prohibited. Bog Elfin’s sole host plant is Black Spruce (Picea mariana). The young larvae burrow into new growth pine needles and eat inside them, while older ones feed on the outside. Larvae are probably mature by June or July, and most of the year is spent in pupa form, in the leaf litter at the base of the trees. Adults nectar on leatherleaf, rhodora, blueberry, and pin cherry. In 2013, it was photographed in Ashburnham nectaring on purple chokeberry (Aronia melanocarpa) ( http://brucedegraaf.zenfolio.com/p49993981/e608d85bc ). Black Spruce-Tamarack bogs, relicts of the glacier era, are the primary habitat. But at least in Maine, it is not restricted to this habitat, and can be found in any forested areas with black spruce (Webster and deMaynadier 2005). 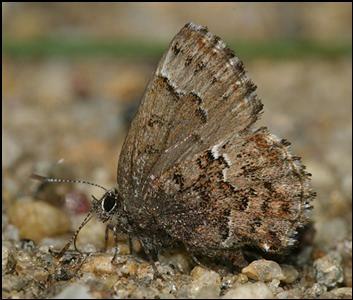 The butterfly may inhabit the most central, inaccessible parts of the bog, where there is some open water and only scattered stands of Black Spruce (Layberry 1998), but in Maine it is found in black spruce on the perimeter of bogs, and not in the wetter bogs where spruce is stunted (Webster and deMaynadier 2005). In the Tom Swamp bog in Petersham, Massachusetts, the butterfly conveniently alights on a dirt road constructed through the bog, although one may have a long wait before it decides to show. Happily, a second location has surfaced. Bog Elfin was reported from a black spruce bog in Ashburnham as early as 5/26/2008, and again on 5/19/ 2012, by T. Murray. The sighting was finally confirmed by identifiable photographic evidence in 2013 (see links above). In 2013 many MBC observers saw and photographed the species at that site, with a high count of 3 seen on 5/28/2013. Bog Elfin is clearly still Rare in the state today (Table 5). There are no MAS Atlas records of Bog Elfin because the species had not been found here then. There is a single flight period in late May. The earliest sighting date is 5/18 in 2013 (photograph, B. deGraaf and G. Kessler, Ashburnham); the latest is 6/7 in 2007 (Petersham, R. Hamburger). Bog Elfin’s global conservation rank is S3, or vulnerable. The species has a limited range and appears to be absent from many suitable bogs. On the other hand, there are a lot of bogs within its range, and so certainly there are some undiscovered colonies. Although it is not in immediate danger at most sites, it is too scarce and local to be presumed secure For MA, NY, Nova Scotia and Ontario (the southernmost parts of the range) the species’ state NatureServe rank is S1 or ‘critically imperiled’; in NH it is possibly extirpated, and in ME it is S3 or vulnerable (NatureServe 2010). In Massachusetts Bog Elfin is state-listed as a Threatened species. Sightings should be reported at http://www.mass.gov/dfwele/dfw/nhesp/species_info/pdf/electronic_animal_form.pdf . The kinds of activities that have posed threats to this species across its small range are biocides against spruce budworm, mosquitos, and black flies; draining and impoundment of bogs; and peat mining. At the sole New York site near Cicero, Bog Elfin has probably been negatively impacted by aerial spraying for mosquitos. Some of the Maine sites have no formal conservation protection and are on private land (NatureServe 2010). By contrast, the main Massachusetts site seems fairly well protected. Given its specialized habitat in northern spruce bogs, and possibly limited ability to colonize new areas, this species is likely to be negatively impacted in Massachusetts by climate warming (Table 6)..